Former astronaut's son and videogame creator Richard Garriott has finally left Earth's atmosphere and filled a lifelong dream of visiting space. Garriott, the designer of PC franchise Ultima, becomes the sixth private citizen to reach space, but was originally meant to be the first. In 2001, Garriott was pencilled in to be the first space citizen to reach the cosmos, but he lost money in the DotCom crash of that year and had to make way for Dennis Tito, who took the prestigious accolade. Garriott's launch, aboard Soyuz TMA-13, actually took place 12 October, but Garriott, now a full fledged space participant, docked with the International Space Station yesterday. 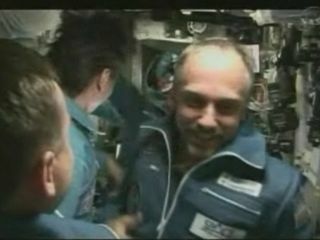 Garriott is part of an 18-man crew in space to supervise the start up of a new life-support system for the station. This is all part of an expansion for the space station that will eventually house six full-time members of staff. Garriott has spent eight months in Russia's infamous Star City in preparation for his space citizen role. The cosmonaut training camp was used by none other than Yuri Gagarin. To view a video of the docking, go to the Technology section of BBC.co.uk.